Well assuming that I’m in the mood to talk and the person next to me is also willing to oblige, the easy answer is Jesus, Confucius, Buddha, or some other iconic spiritual dude. For me, it’s Albert Schweitzer. His writings inspire me, provoke me, and anger me. 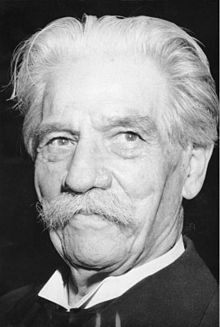 Albert Schweitzer was an theologian, musician, philosopher, and physician. Schweitzer challenged both the secular view of historical Jesus current at his time and the traditional Christian view, depicting a Jesus who expected the imminent end of the world. He received the 1952 Nobel Peace Prize in 1953 for his philosophy of “reverence for life”, expressed in many ways, but most famously in founding and sustaining the Lambaréné Hospital in Gabon, west central Africa. Below are the “best of the best” Schweitzer quotes that I’ve assembled over the years. If you happen to come across one I’ve missed, please share it. “By respect for life we become religious in a way that is elementary, profound and alive. Impart as much as you can of your spiritual being to those who are on the road with you, and accept as something precious what comes back to you from them.